With over 30 years of experience in air quality testing, RPC’s air quality laboratories offers an extensive array of air testing services conducted by highly qualified scientists. The air quality laboratory is ISO 17025 accredited for many types of analytical tests and routinely provides testing services such as radon in air, radon in water, mould in bulk materials, mould in air, asbestos in bulk materials and asbestos in air. 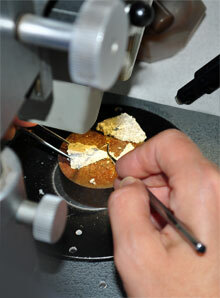 Custom analysis services covering an extensive range of compounds are also available upon request. RPC’s air quality scientists routinely conduct asbestos surveys for industry and government, as well as clearance testing for hazardous waste removal projects. Providing high quality sample collection and analysis along with rapid turnaround times, RPC’s air quality services are second to none. If you have an air quality concern and would like a scientist to assist you with your testing requirements, contact the air quality laboratory and a scientist will be available to help you. © 2019 RPC. All rights reserved.